Nowadays, there are endless programs available to enhance your education, and ultimately decide the direction of your future...you just have to do the research and find them! 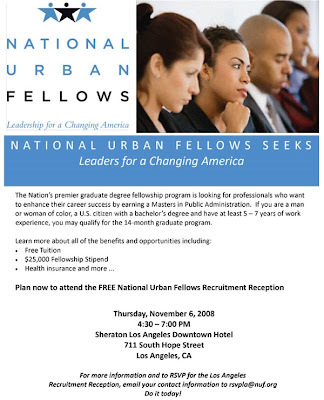 If you're seeking a degree in Public Administration, contact the National Urban Fellows, you may qualify for their 14 month graduate program in which they are offering Free tuition, $25,000 fellowship stipend, health insurance...and many more perks. Plan now to attend the FREE Recruitment Reception, Thursday, November 6, 2008@ the Sheraton Los Angeles, Downtown. RSVP rsvpla@nuf.org.